Don’t judge a book by its cover, the saying goes. There’s no doubt, though, that a book’s cover can say an awful lot about what’s inside. Deciding what work should go on the cover of the forthcoming book Art at Te Papa — Michael Illingworth’s Untitled 1971 — wasn’t easy. We tried lots of different possibilities, shopped ideas around, got sometimes contradictory advice and then, after nothing quite seemed to work, the Illingworth presented itself as one of those ‘what if we tried this…’ ideas. It works amazingly well — striking, enigmatic, iconic — and what better cover image for a book about art than one that stares back at you. The final design was done by Neil Pardington at Base Two. The painting was part of a wonderful collection given to the museum in 1995 by Wellington collectors Hans and Martha Lachmann. 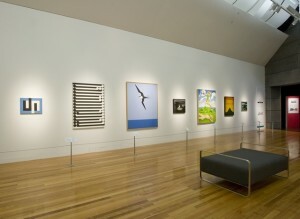 It was also featured in the 1992 exhibition Headlands: Thinking through New Zealand art at Sydney’s MCA, which led to a reassessment of Illingworth’s status in New Zealand art. He’d kind of fallen out of fashion and Headlands showed him a new light. Collection focus – In a clear light. Visble are works by Gordon Walters, Don Binney, Ian Scott and Michael Illingworth. Two works by Illingworth — Untitled and Pah Hill — are currently on show in the collection focus part of Toi Te Papa. This selection of works was meant to have been on show during the Rita Angus exhibition (the Lachmanns were also the donors of this painting, one of my favourite Angus works) but things didn’t quite work out that way and it went up a couple of weeks before Rita closed. 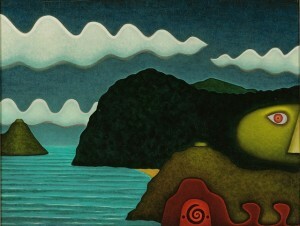 Speaking of which, the Rita Angus exhibition finishes at Dunedin Public Art Gallery on 15 February. The gallery’s been running a nice events programme with the exhibition and if you’re there during the last weekend, you can catch two contributors to the catalogue, Sarah Hillary and Vita Cochran, talking about Angus’s work. Thanks for your comment, Roger. The book will indeed have a presence as part of collections online, although we’re still working out exactly what shape this will take. Excellent to see the art side of Te Papa blogging! Congratulations on the new book. Any chance of getting the material prepared by the curators up on collections online too? My year 13 students are more likely to engage with Te Papa’s collection via the net than through a book. Love to read your thoughts on Unsuitable for Framing as I teach a lot of these artists in my course.